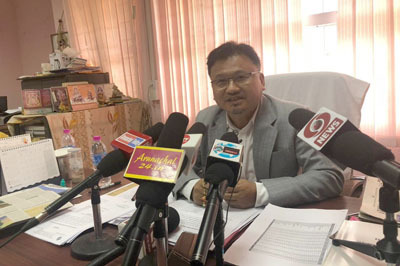 PASIGHAT, Apr 8: Since the Election Commission of India (ECI) issued the notification for simultaneous polls in Arunachal on 18 March, more than one lakh bottles of Indian Made Foreign Liquor (IMFL) have been seized from across the state between 18 March and 6 April. According to the seizure list (till 6 April), beer seems to be the brew of choice as more than 70,000 bottles of it have been seized. Vodka appears to be least popular with just six bottles or so seized so far. East Kameng district tops the seizures list, followed by Kurung Kumey and Upper Subansiri, according to a government document. The seizures are a result of the combined efforts of the police, the static surveillance teams, and the flying squads. The tax, excise & narcotics department has already formed district liquor monitoring squads to monitor the movement and sale of liquor in every district. The squads are empowered to search, seize or detain illicit liquor under the AP Excise Act, 1993. The department has also reduced the business hours by three hours, while dry days start from 9 to 12 April, and from 22 to 24 May. “Liquor distribution is essentially a social problem and requires social intervention, not just an administrative one. The administrative efforts of the department can at best facilitate and assist a larger social effort for voter reformation,” said Tax, Excise & Narcotics Commissioner Anirudh S Singh. 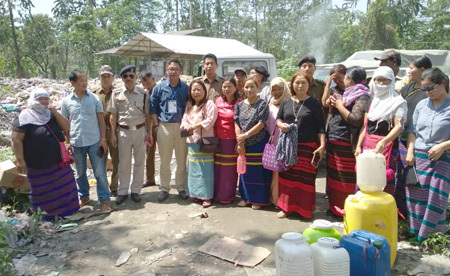 Meanwhile, the Women Against Social Evils (WASE) here has appealed to all the legislative and parliamentary election contestants not to serve or distribute IMFLs among the voters in East Siang district. The organization has put up banners, in English and Adi, at the homes of all the contesting candidates in the district. “Let us all love and nurture our youths in the right direction for a better tomorrow. Show your love by not distributing alcohol this election,” the banners read. The organization, however, is not against serving of limited amounts of apong. The appeal has come as a blessing in disguise for the candidates themselves. A contestant said that, before the 2014 elections, one had to spend more than Rs 20 lakhs on IMFLs, which has drastically gone down this year. “Its not that we did not spend money on alcohol, but because of the WASE’s 2014 intervention, this year the expenditure on alcohol is much less, and it is not being served or distributed openly,” a candidate said. “Whenever people demand IMFL, we just point to the WASE appeal,” said a member of a contestant’s family, adding that the banner with the appeal has been kept right near the community dining area. In 2014, WASE members had confiscated IMFLs from the homes of candidates. “It’s out of respect for the WASE that we are not serving IMFL openly, though apong is served every evening,” said a supporter who is in charge of preparing apong. 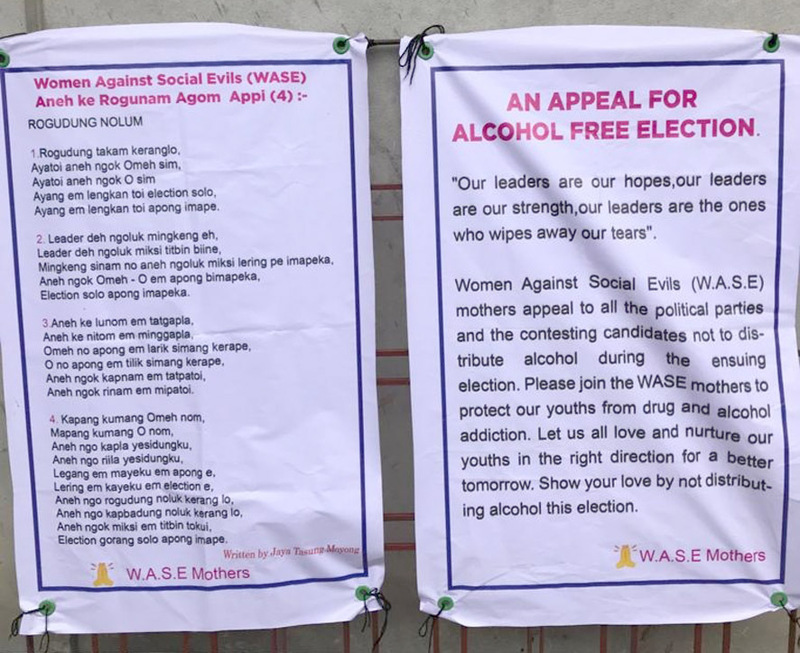 Joya Tasung Moyong, the general secretary of the WASE, said the results of the efforts of the organization in stopping excessive use of alcohol are visible. “Contestants have taken upon themselves not to serve IMFL,” she said. 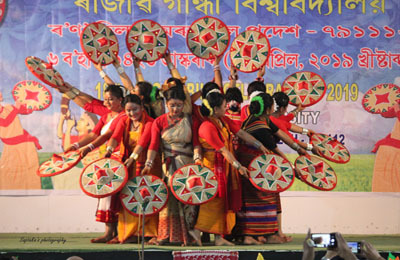 Moyong said several members of the WASE are in the PPA, the BJP and the Congress, and are campaigning for their respective candidates, but, leading by example, these women do not serve alcohol, drink or eat at feasts organized by the candidates. He said the superintendents in the districts have been asked to engage women for destruction of seized liquors.